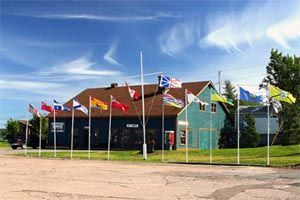 Housed in the former crash-boat terminal for the first Trans-Atlantic Passenger Flights, the Botwood Heritage Center is dedicated chiefly to the preservation of the community’s heritage. Exhibits and artefacts reflect themes including World War I & II, the Botwood Cottage Hospital, Shipping and boatbuilding, the Beothuk, Antique Snowmobiles, a 1940's Period Room, an antique long gun exhibit and a technology exhibit. We also have the Botwood Flying Boat Museum which is in a separate building on the other side of the airbase. Admission for 1 museum: $5.00 for adults, $3.00 for students. Children 12 and under are free if accompanied by an adult. Admission to both museums is $8.00 for adults and $4.00 for students. Heritage Today Gift Shop Onsite. .Mid-June to September 30, daily, from 11:00 am to 7:00 pm.